Watch full One Piece Season 15 Episode 55 English Dubbed full HD online. One Piece Episode 571 English Dubbed online for free in HD. The rest of the Straw Hats are waiting for Luffy, Zoro, and Sanji to return with the treasure. Meanwhile, Pekoms and Tamago came for the candy but the Minister of the Left claims that here is no more candy and the factory machines have been destroyed by Hordy. Luffy, Zoro, and Sanji find Caribou and the treasure and start to carry the treasure back, searching for a ride back to Ryugu Palace. They find Pekoms and Tamago with the Minister of the Left. Luffy gets interested by Pekoms and Tamago’s looks and then realize they are part of Big Mom’s crew. Big Mom in the New World on Whole Cake Island is waiting for the candy from Fishman Island. Bobbin comes right after Big Mom eats some of her crewmates. Bobbin tells her that he destroyed an island and it smelled sweet when he did. She then learns that Fishman Island will not be giving her candy. She calls Tamago and Pekoms and they dare not answer so Luffy does. Luffy tells her that he ate the rest of the candy and he is willing to give the treasure to her for repayment. Big Mom refuses, stating that she can’t eat treasure. 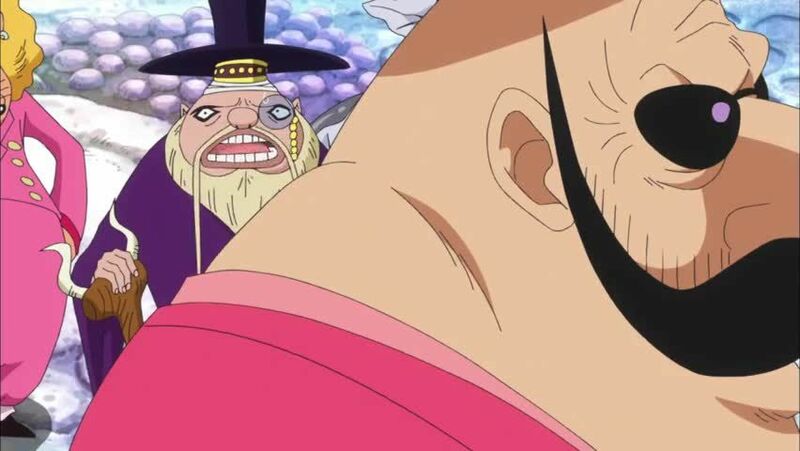 Tamago steps in and tries to talk Big Mom into accepting Luffy’s offer in order to replace the ships that were lost after a run-in with Captain Kid. She refuses, saying that pirates don’t make deals and that she will go after Luffy in the new world instead of the Fishman Island. Luffy agrees to a fight with her and says that he will beat her up and claim Fishman Island as his own territory.